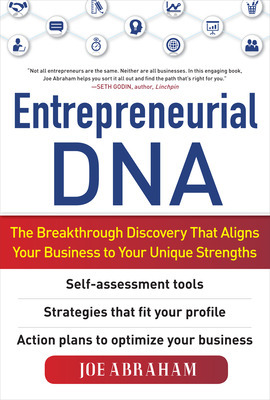 Interview with Joe Abraham, author of Entrepreneurial DNA. If the pet rock, letters from Santa, antenna balls, and other huge money-making creations have taught us anything, it’s that great ideas can come from anywhere. In an interview with Overdrive, the official Entrepreneurs Organization blog, Joe Abraham, author and president and CEO of BOSI Institute, offers an action-plan for how to identify and develop your own strengths and creativity for measurable success. What are some tips entrepreneurs can follow to better leverage their strengths in business? The first and most important thing to do is to figure out what your strengths even are. As entrepreneurs, we are really good at overplaying (or significantly underplaying) our strengths because we seldom have an objective way to measure them. Using a third-party assessment tool like the basic and advanced BOSI Tests bring that objectivity to the table. Next, align your key daily activities around those strengths. If business development is a strength, get out there and make sure most of your time is spent making the cash register ring rather than playing with the accounting system. The same is true on the other side. Don’t spend a ton of time “becoming” a salesperson if that just isn’t an innate strength. Finally, look at your team and make sure their strength/weakness balance aligns well with yours. The easiest way to find yourself in a world of hurt is to get caught in the trap of fitting round pegs in square holes. Make sure your team operates like a well-designed jigsaw puzzle with you at the center. In this day and age, you simply cannot afford misfits. Briefly explain the BOSI system. How does it identify the strengths of business leaders, and how can it help entrepreneurs achieve success? Joe Abraham started his first company at the age of 23. Since then he has served as founder executive or advisor to companies in industries ranging from IT and health care to consumer goods and motor sports and he has served as a consultant to Fortune 500 companies high-net-worth entrepreneurs and celebrities. Abraham presently runs the BOSI Performance Institute . Joe Abraham is founder/CEO of BOSI, a venture-backed business community and online concierge for entrepreneurs. He is author of Entrepreneurial DNA: The Breakthrough Discovery That Aligns Your Business to Your Unique Strengths available in bookstores and online. Prior to launching BOSI, Joe was involved in the startup and growth of over 30 companies in industries ranging from IT and Wellness to Consumer Goods and Motorsports.